King Bistram's stilts are taken away and he becomes depressed. His kingdom, which is surrounded by the sea, is sabotaged by an awful lord. Because the king is so depressed, he neglects his duties and the city is in danger of becoming flooded, until his page boy comes to the rescue. 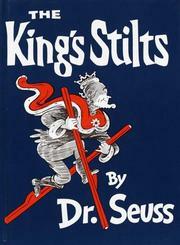 Seuss, Dr., “The king's stilts,” Children's Picture Book Database at Miami University, accessed April 20, 2019, https://dlp.lib.miamioh.edu/picturebook/items/show/7949.